With a record 459 players from 18 countries, the 16th ASEAN+ Age-Group Chess Championships has now begun in Singapore where the SEA (South East Asian) Games in also currently concurrently taking place and which is also part of the island nation 50th anniversary celebrations. 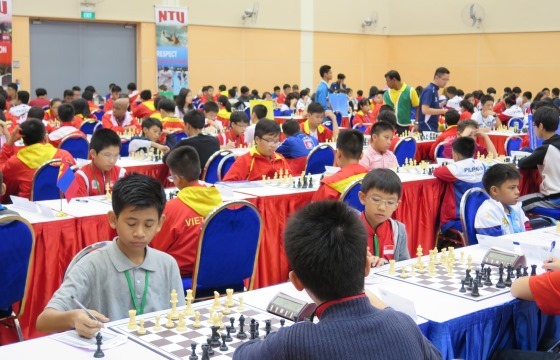 The venue is the very same Nanyang Technological University Sports & Recreation Centre as the highly successful 11th Asian Schools Chess Championships which ended just the day before with more than 100 players less but one country more! Due to the huge response and to accommodate last minute appeals from regional national chess federations to its newly ungraded to continental championship status, the organisers agreed to delay the technical meeting and shift round one from 9. a.m. in the morning to 2 p.m. in the afternoon. 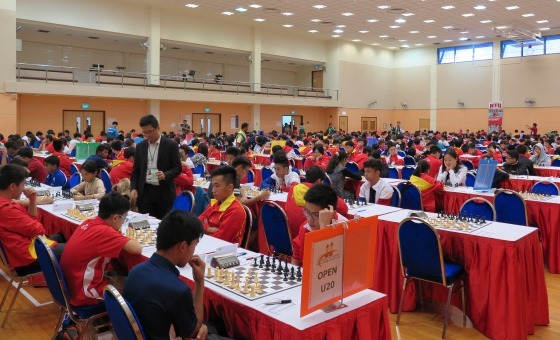 Last year’s overall champions Vietnam has sent the largest delegation with 132 players, a statement of intent, and a total that even eclipses host Singapore who with the school holiday break managed to enter 124 players. Other large delegations include the Philippines with 64, Mongolia with 41 and India with 34 while seven of the 10 member ASEAN Chess Confederation grouping are present, only Laos, Cambodia, and Brunei are unrepresented. The 16th ASEAN+ Age-Group Chess Championships which is played in all three formats of the game – standard, rapid and blitz – is organised by the Singapore Chess Federation together with the ASEAN Chess Confederation under the auspices of the ACF (Asian Chess Federation) and the FIDE (World Chess Federation).